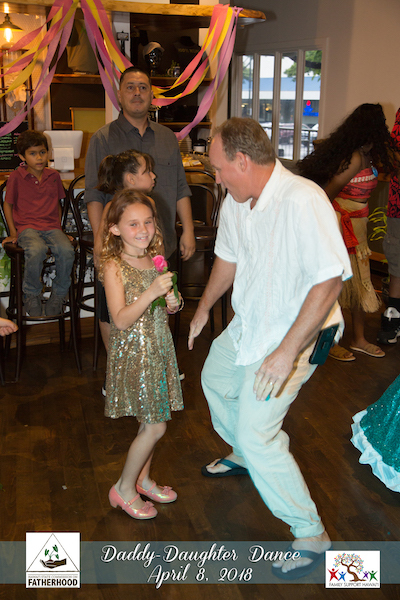 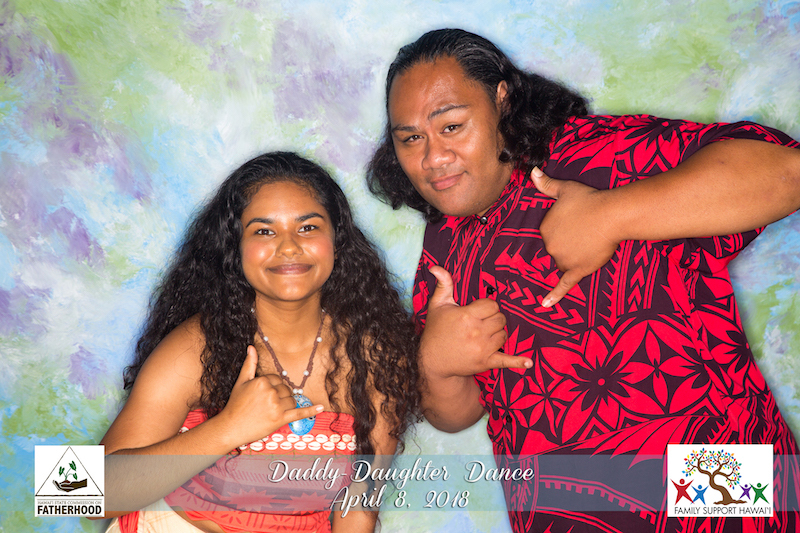 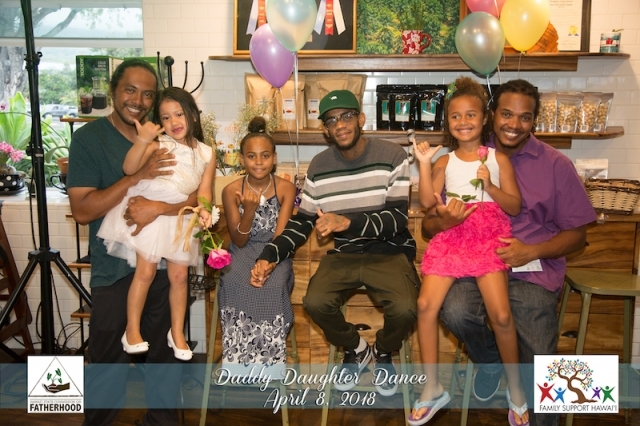 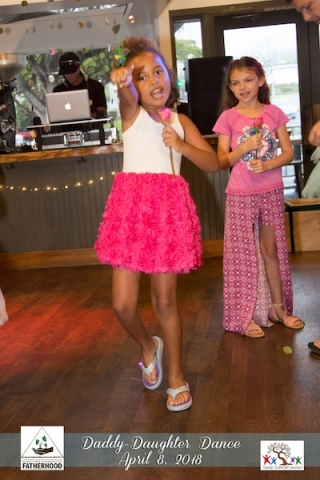 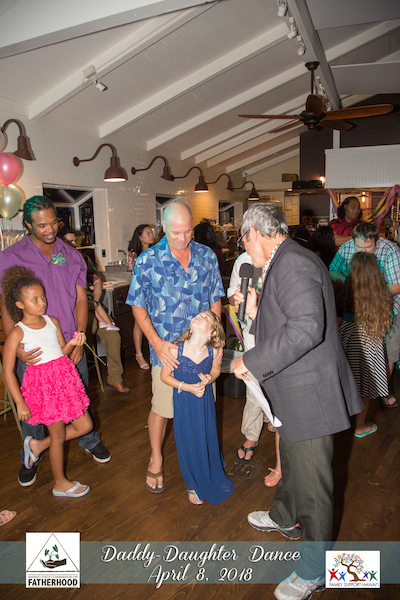 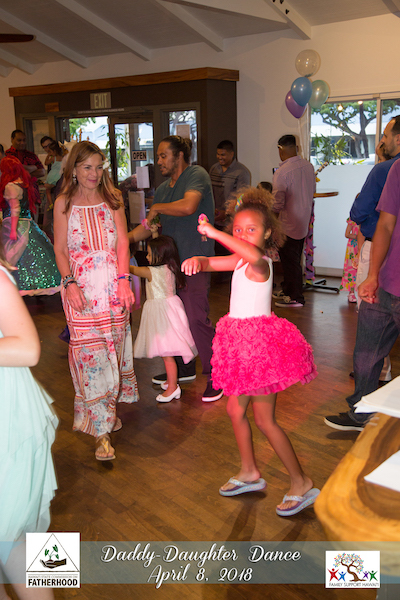 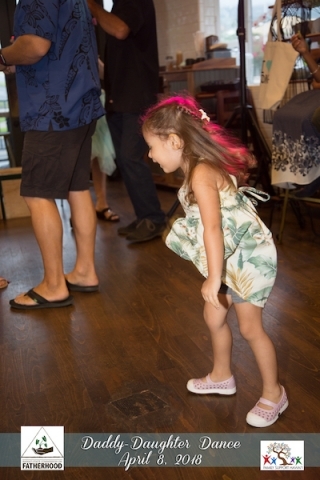 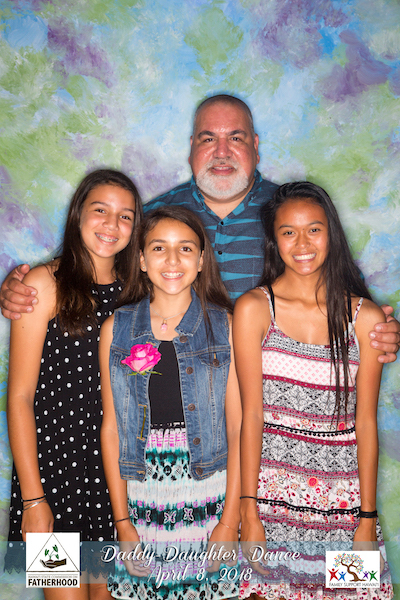 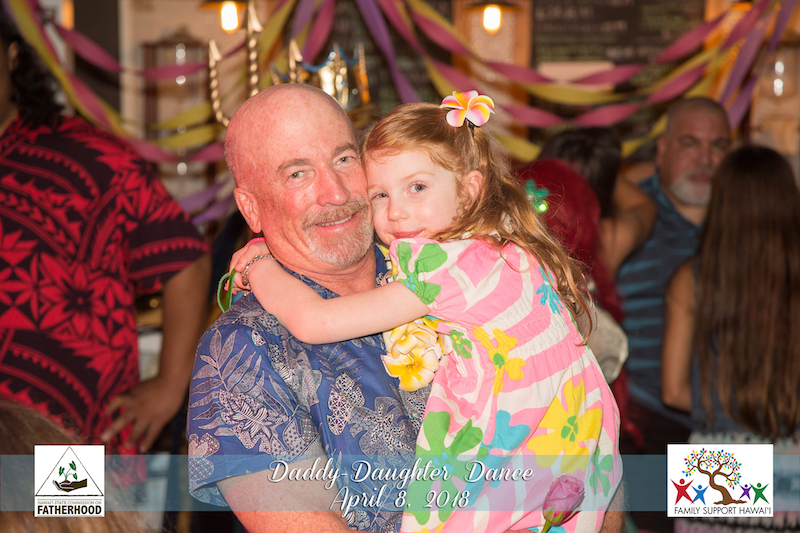 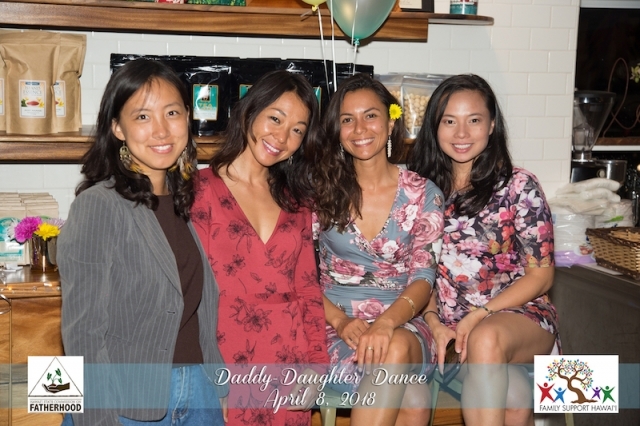 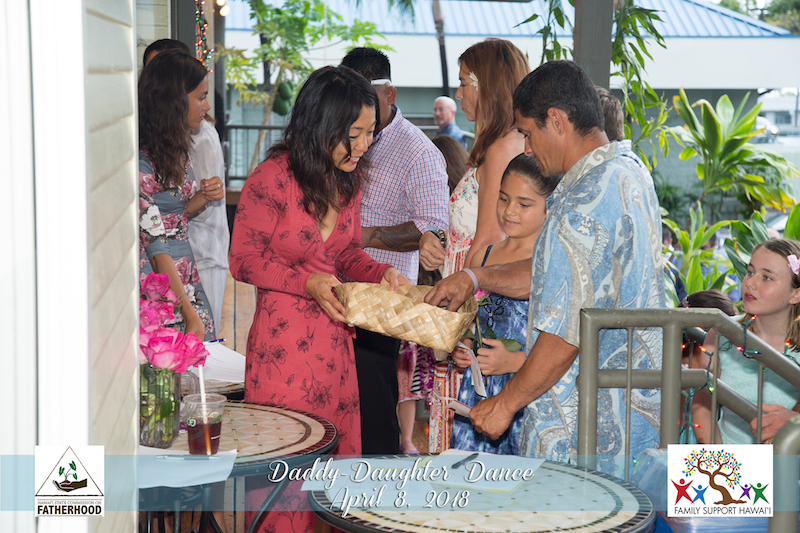 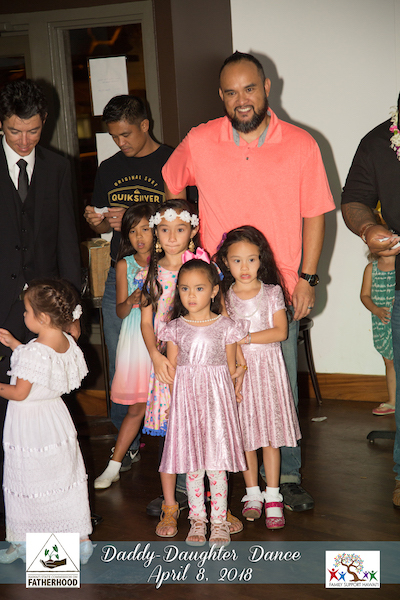 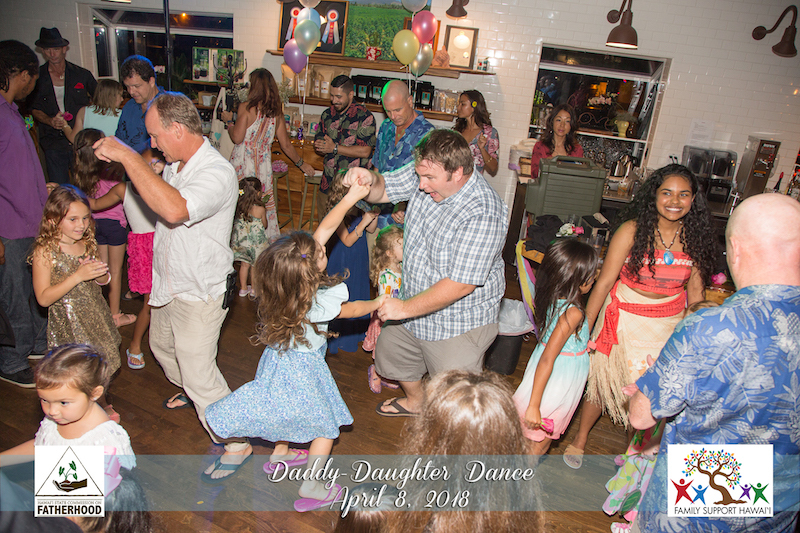 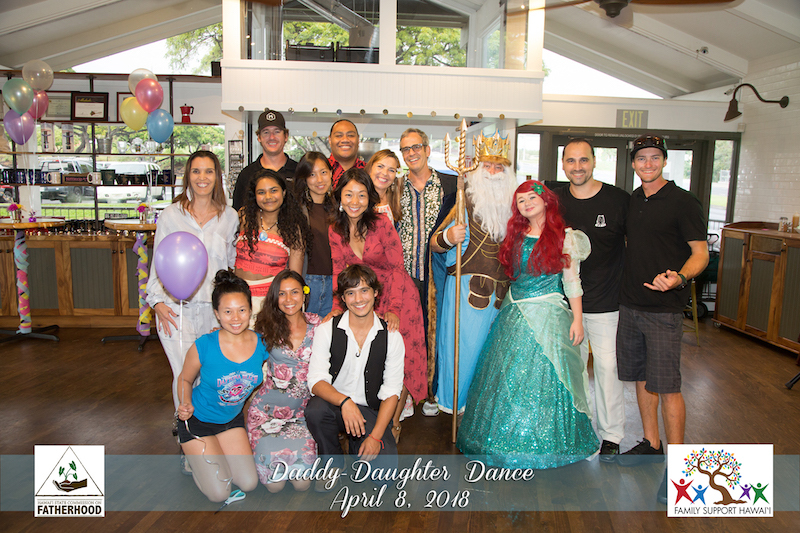 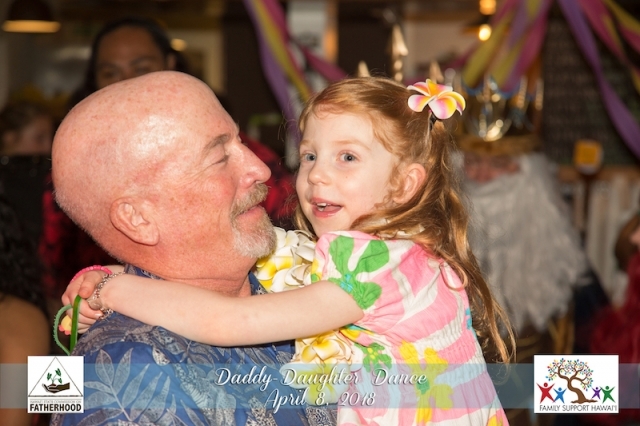 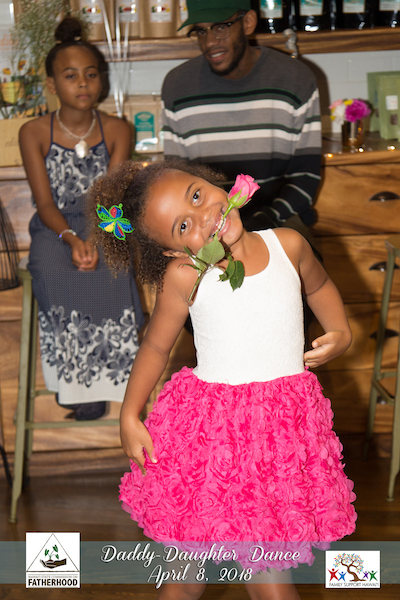 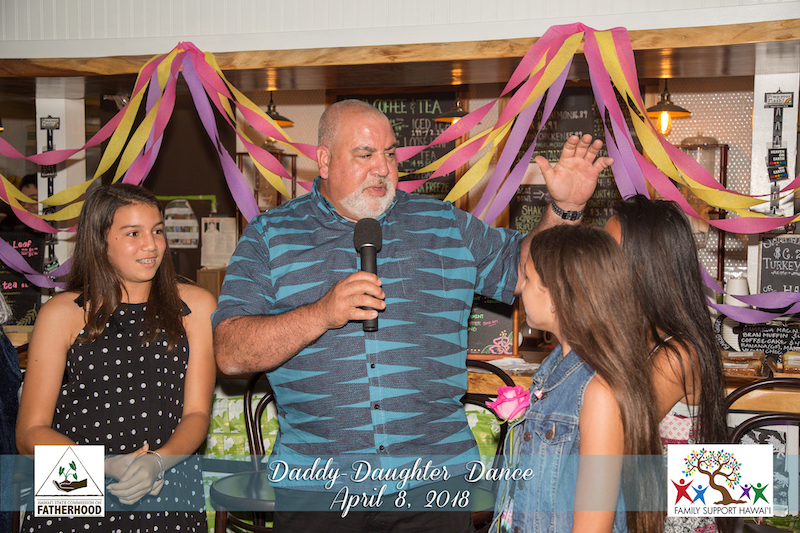 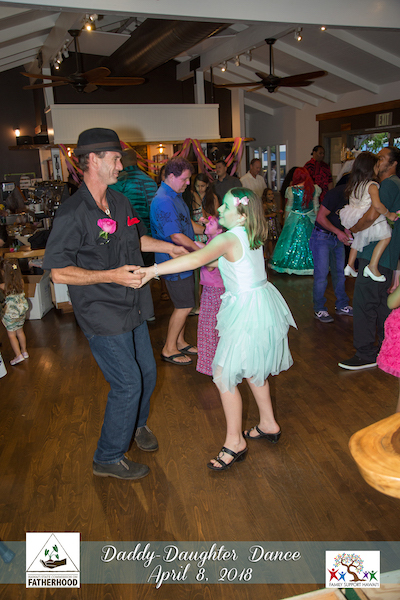 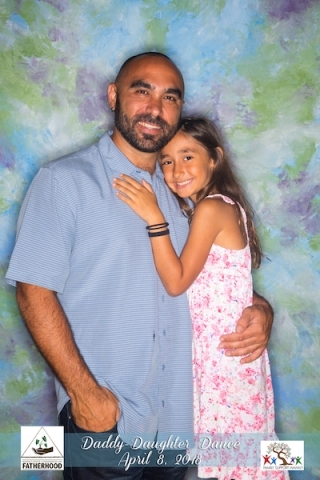 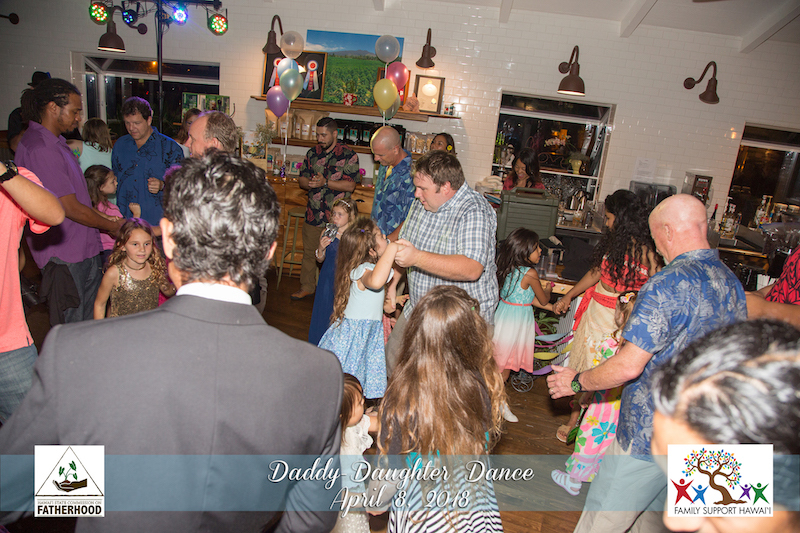 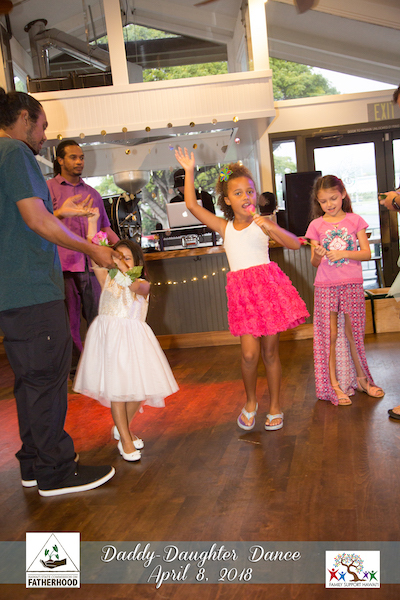 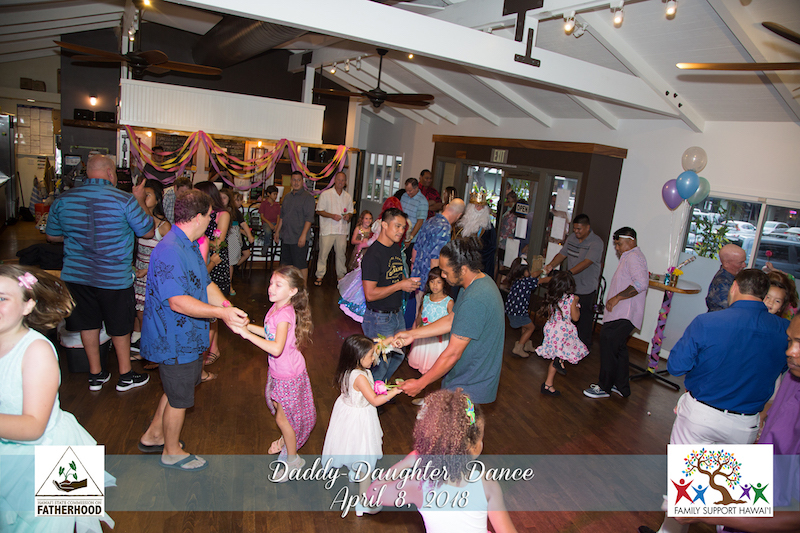 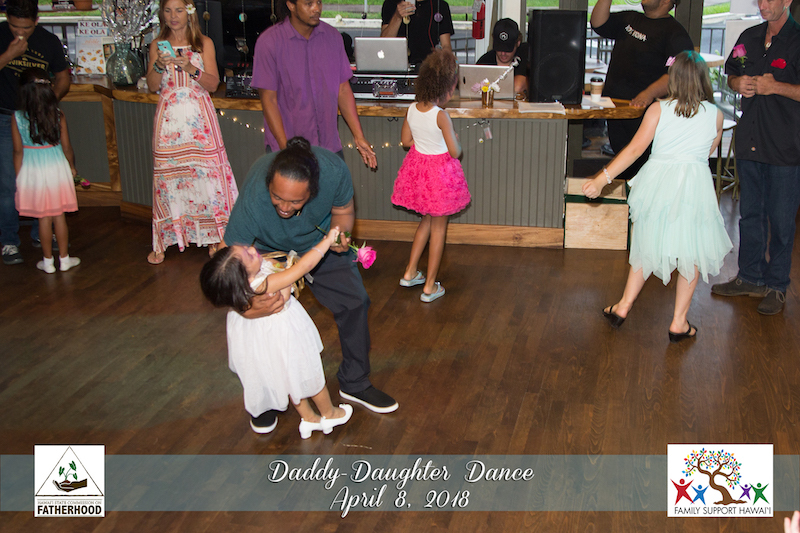 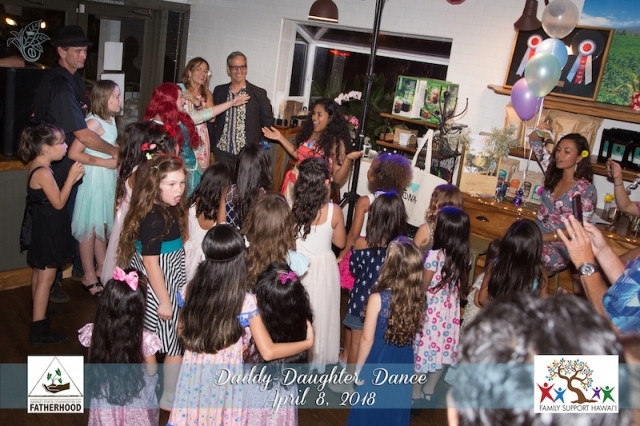 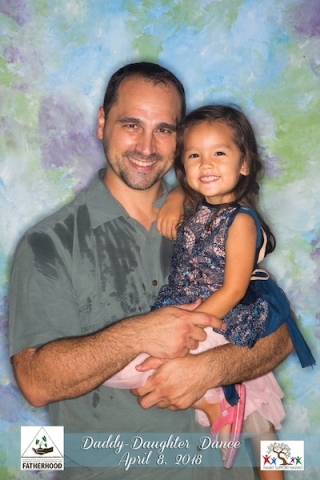 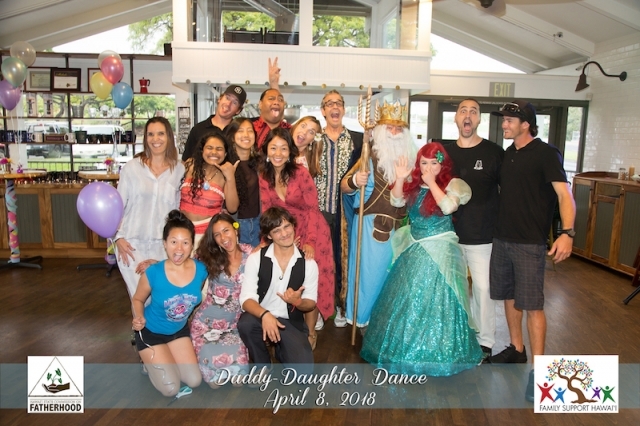 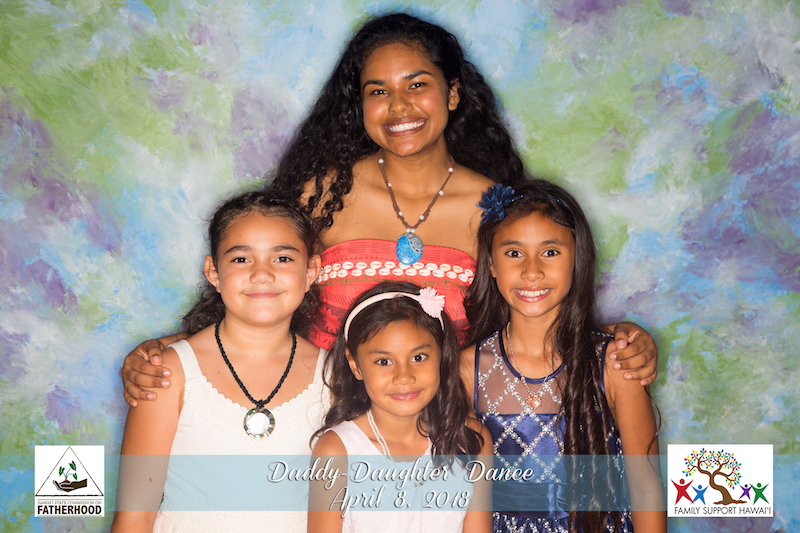 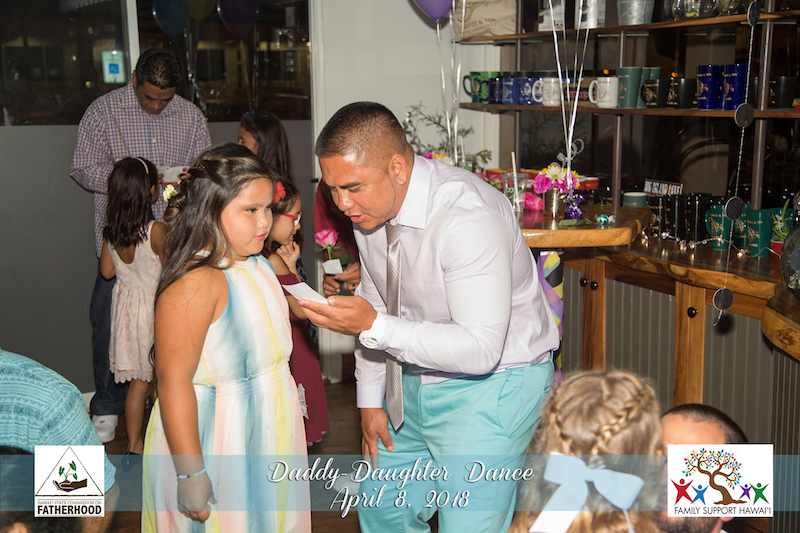 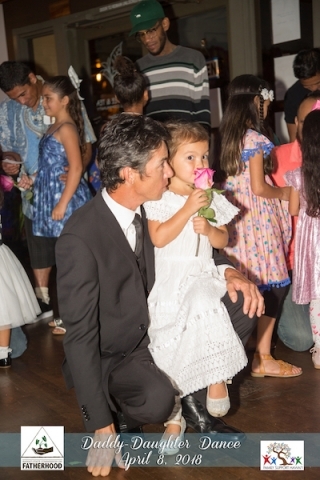 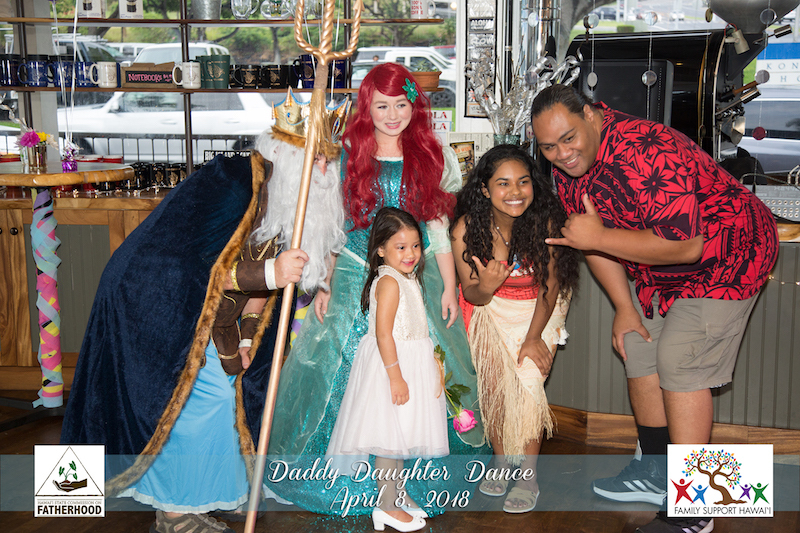 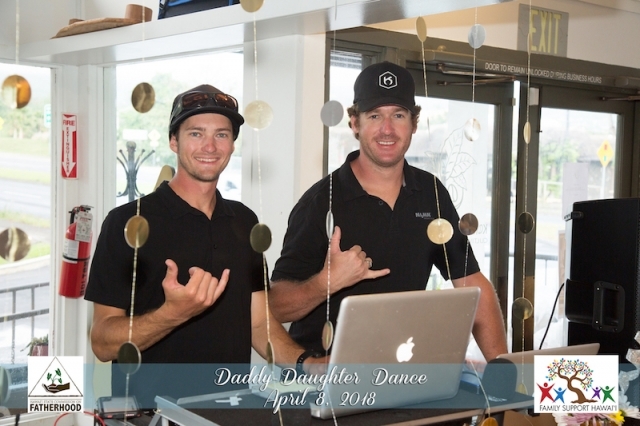 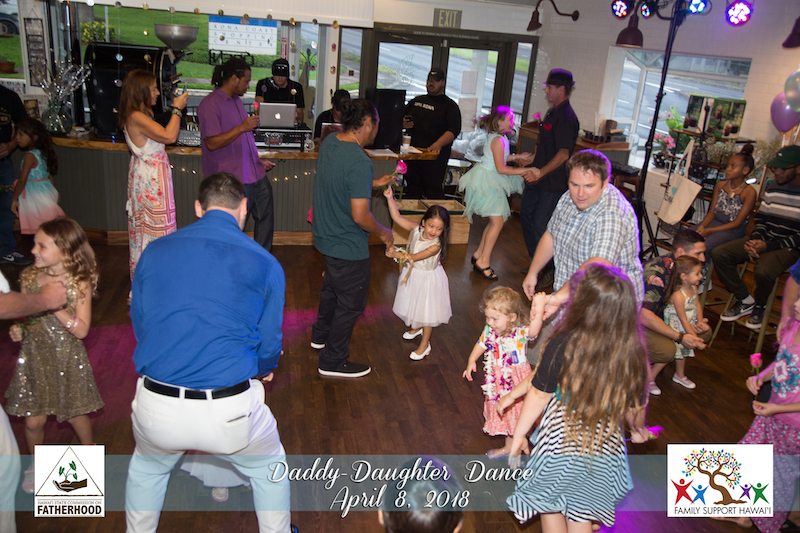 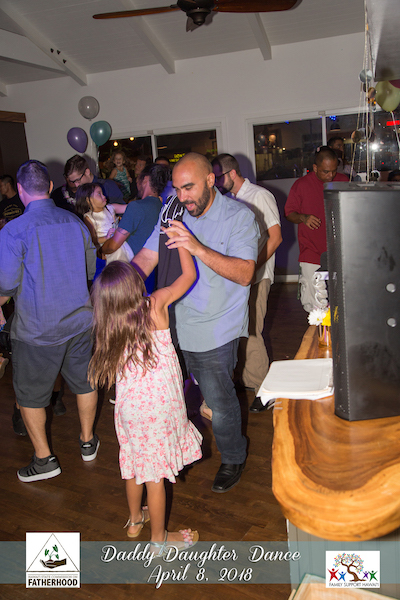 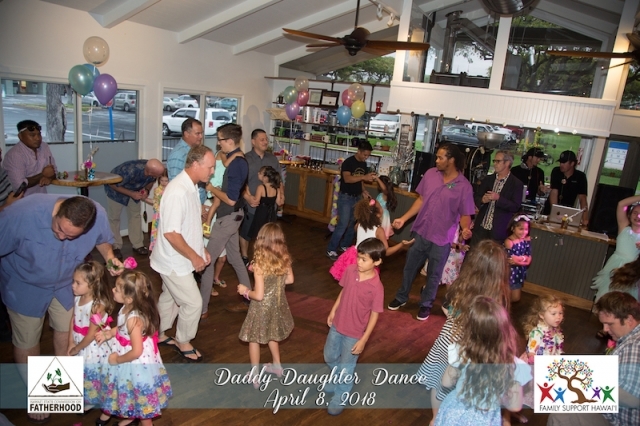 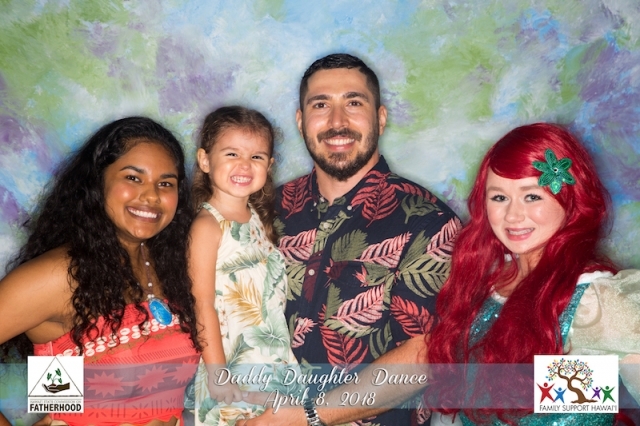 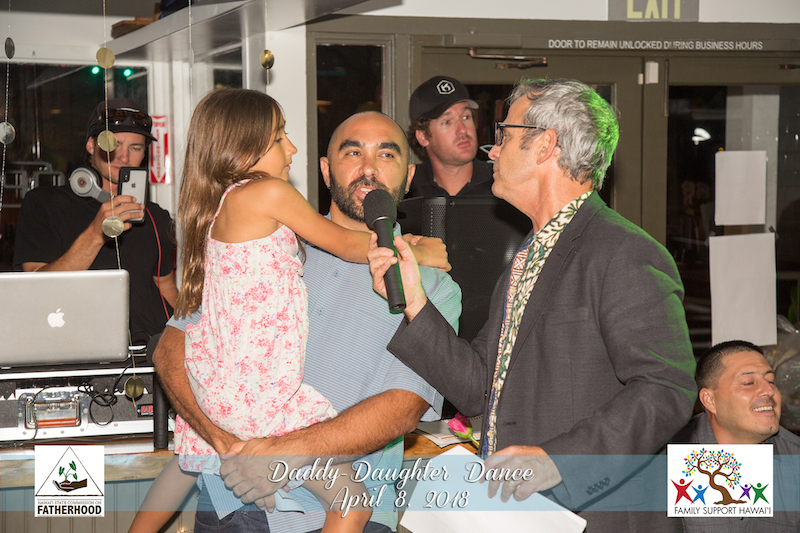 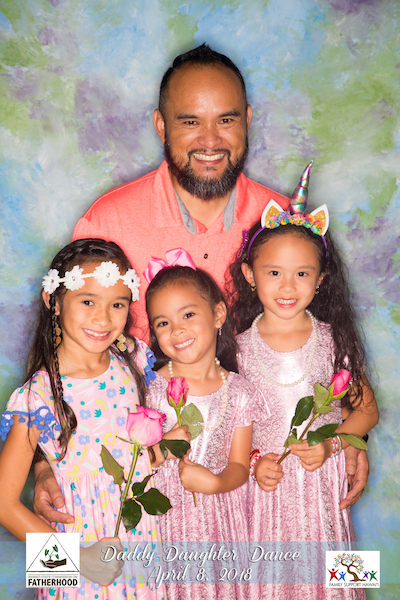 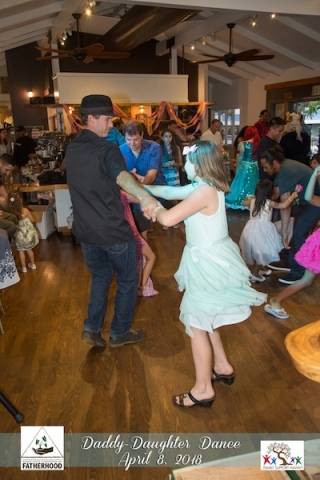 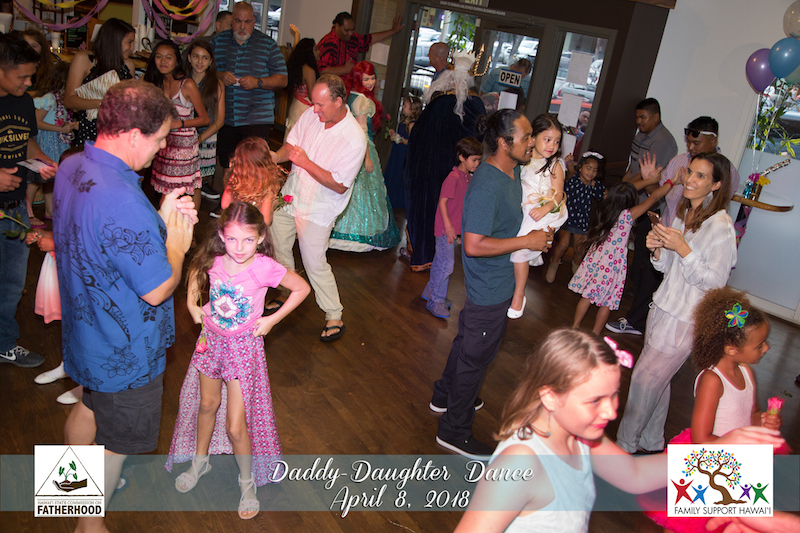 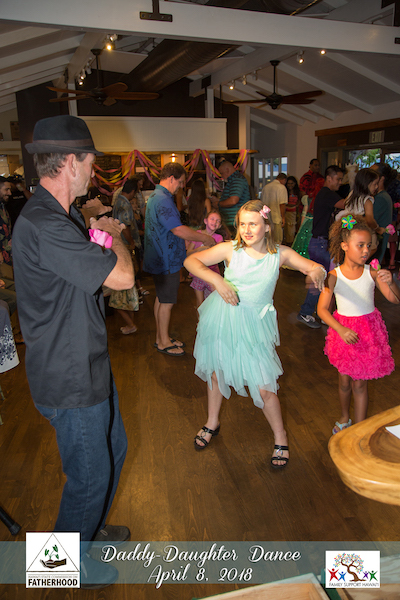 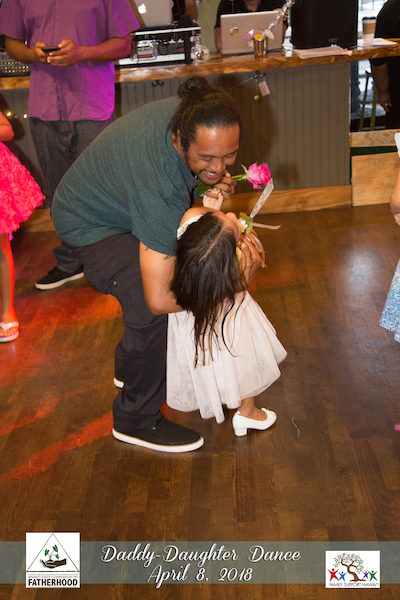 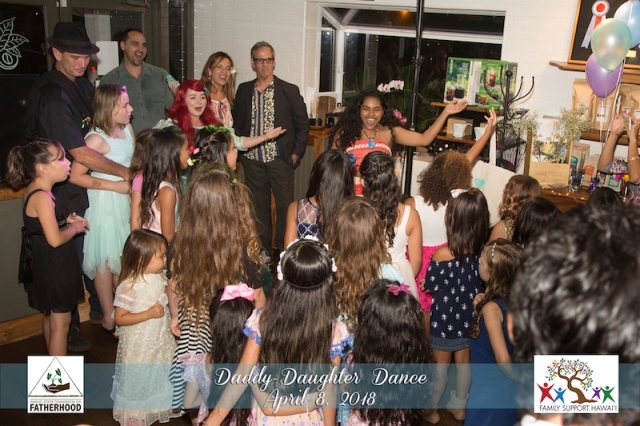 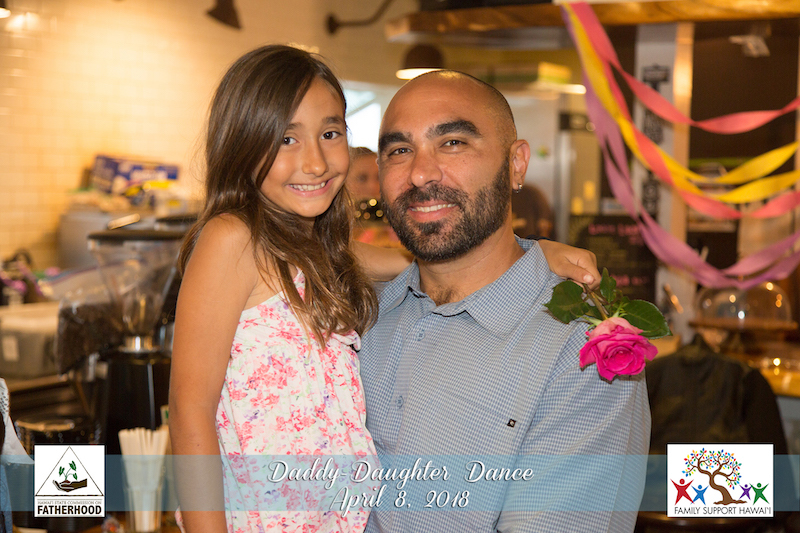 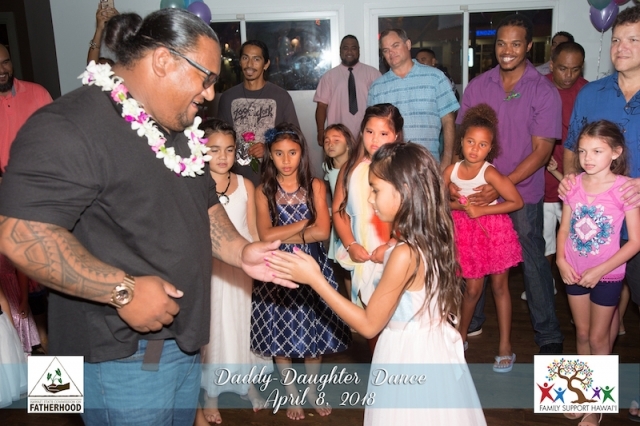 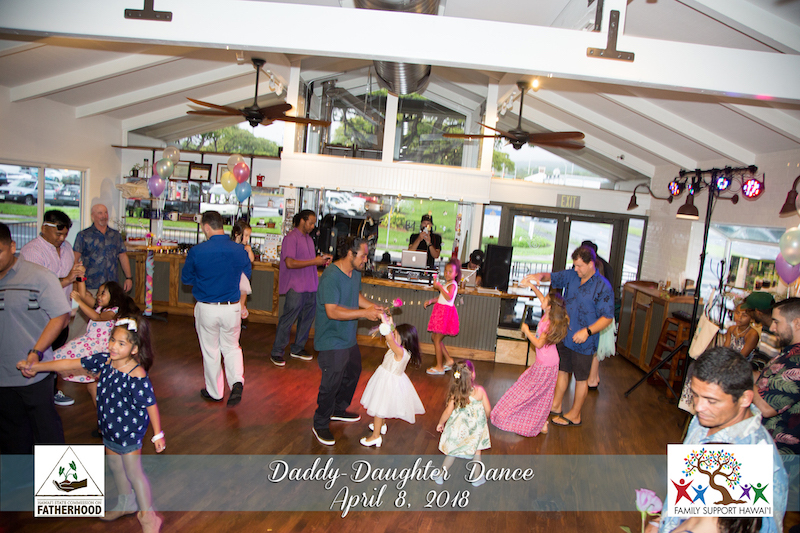 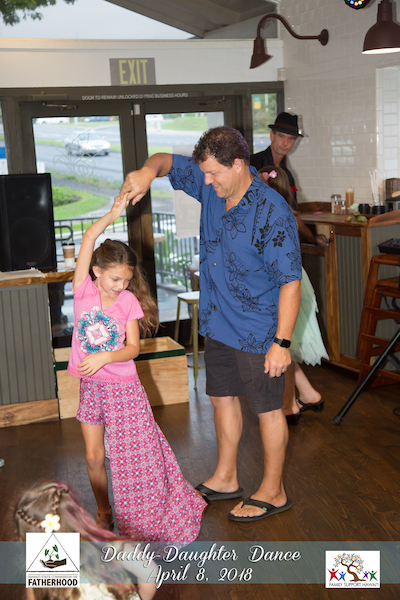 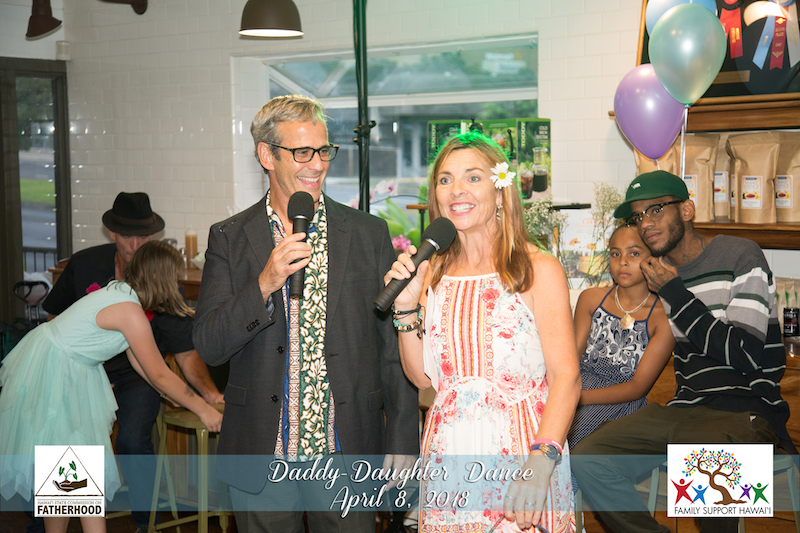 Wednesday April 7, 2018 the West Hawaii Fatherhood Initiative held their inaugural Daddy Daughter Dance at Kona Coffee and Tea Company in Kailua Kona. The event came to life as the result of an online discussion about the lack of this kind of event for Dad’s in the community. 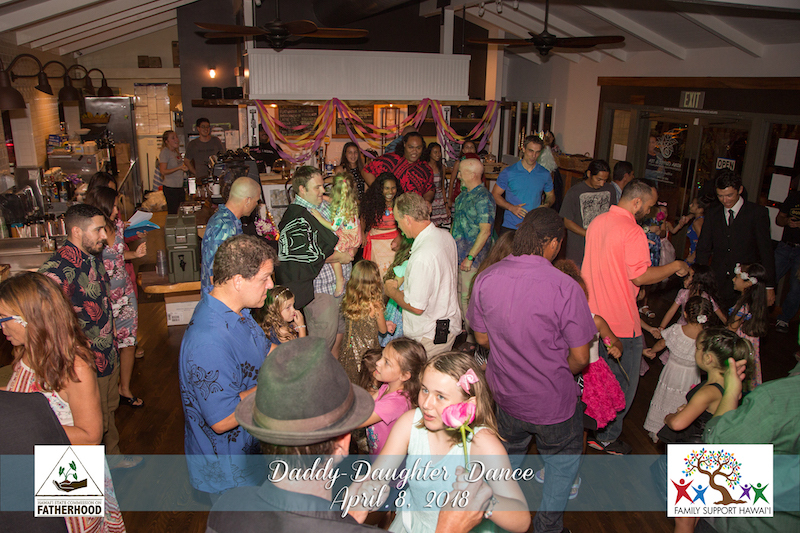 A Facebook page, Kona Dads, was created and a smash team of volunteers came together to organize and promote the dance. 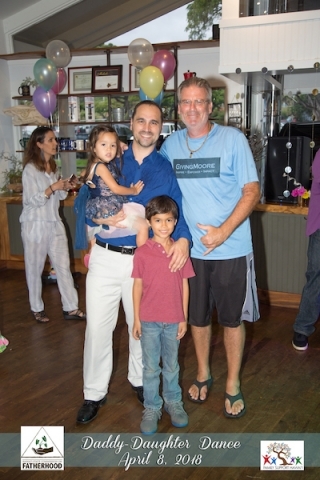 Kona Coffee and Tea offered to host the event and with an occupancy of 85 the venue seemed plenty large enough. 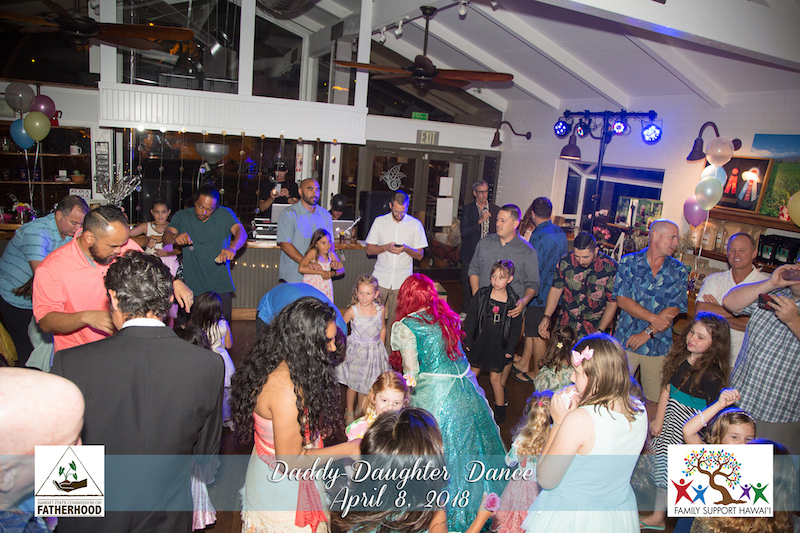 Within 48 hours of going live with the page and announcing the event, nearly 150 people were interested in attending. 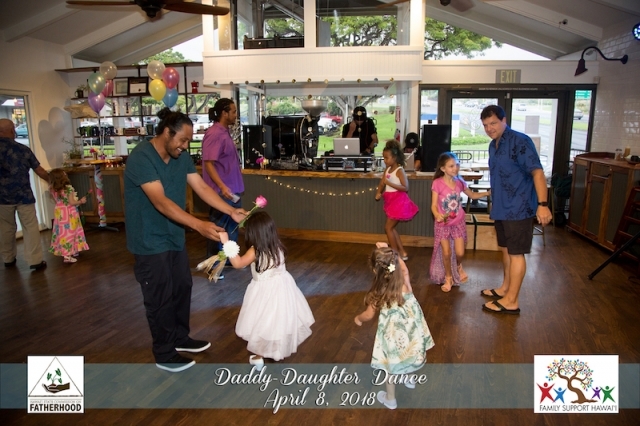 In order to avoid a situation where we would have hundreds of people showing up at the event, we opted to use the online event service, Eventbrite. 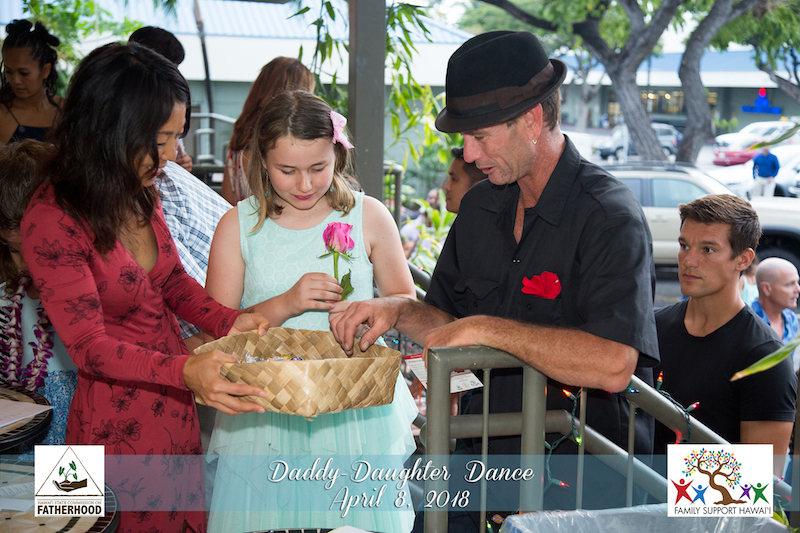 The first round of tickets were exhausted in about an hour, four days later the second round of tickets were gone in just 20 minutes! 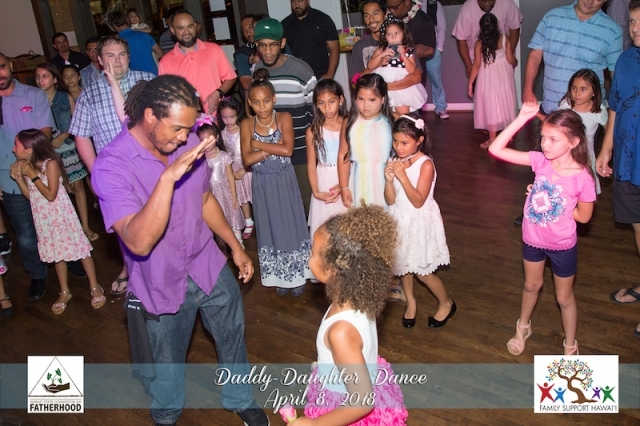 Clearly there was an unmet need in the community for this kind of event. 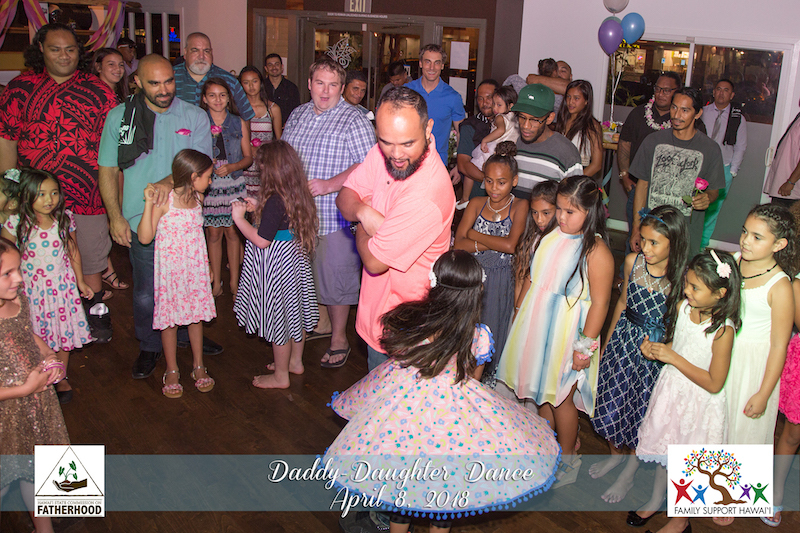 The event itself welcomed 41 fathers with about 60 daughters ranging in ages from 3 to 16 years old. 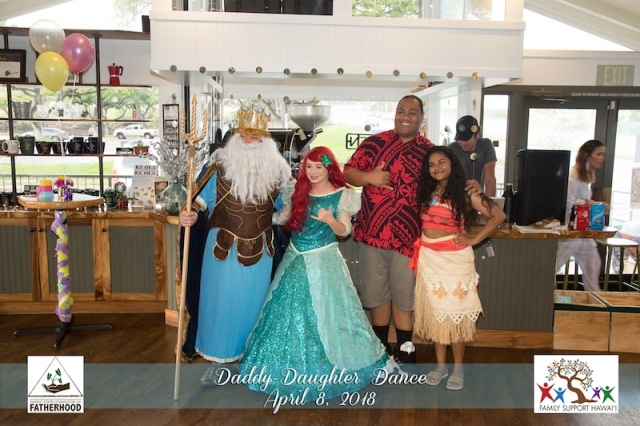 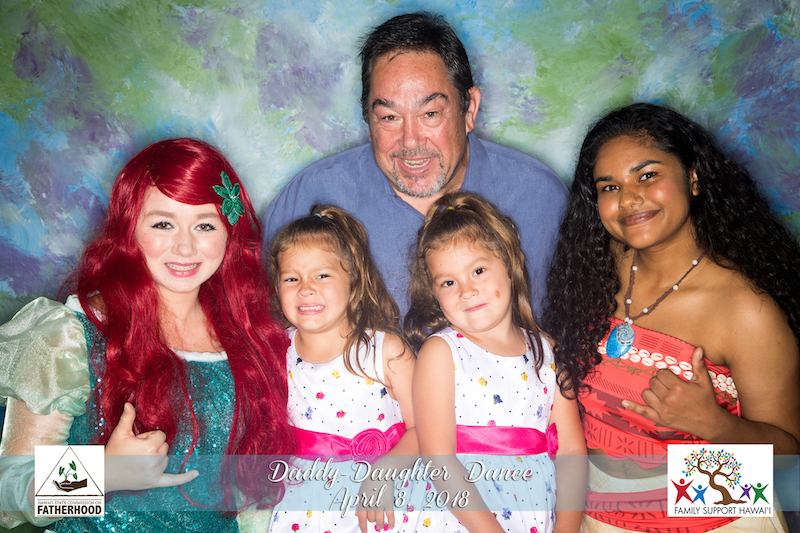 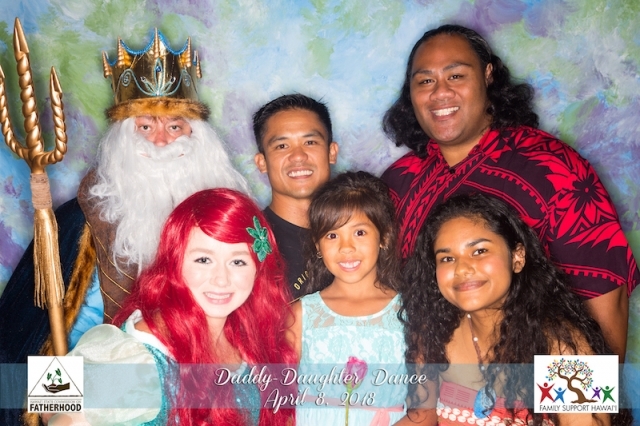 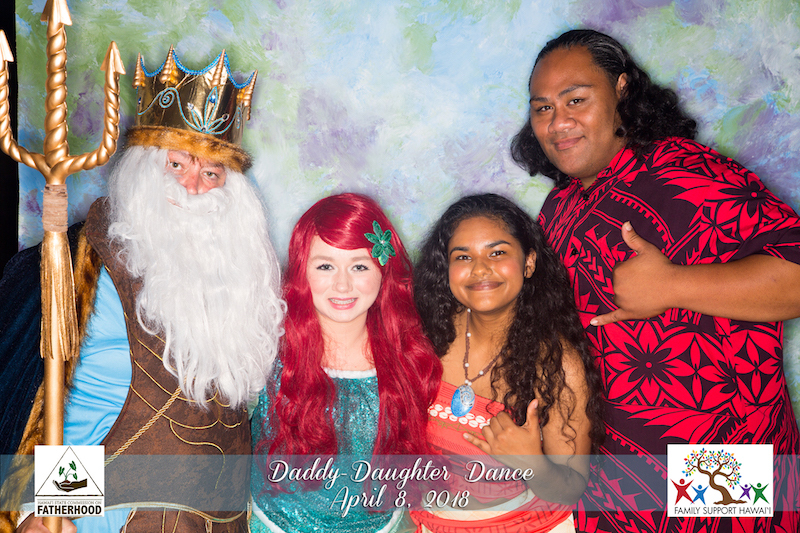 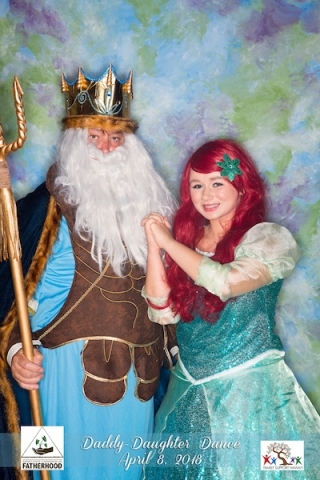 Big Island Princess Parties brought Princess Ariel and Moana with their accompanying Fathers, King Triton and Chief Tui. 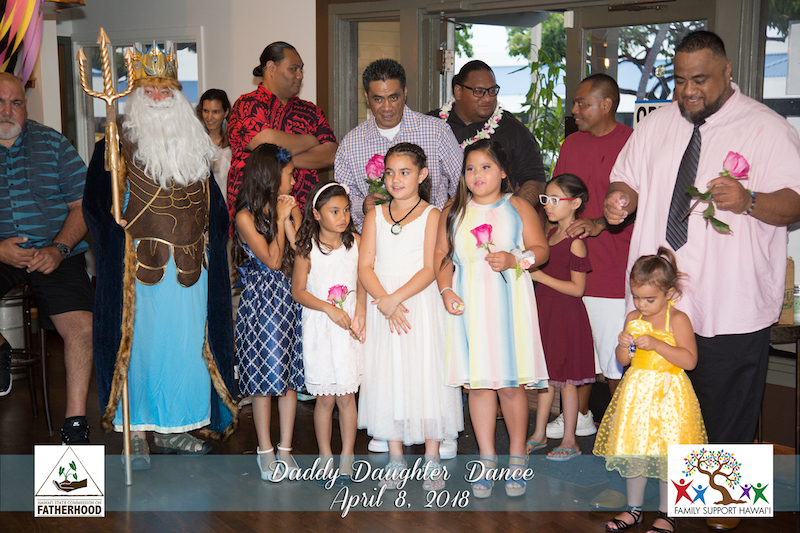 As the fathers and daughters arrived, they were greeted with a rose and a chocolate then welcomed by the princesses. 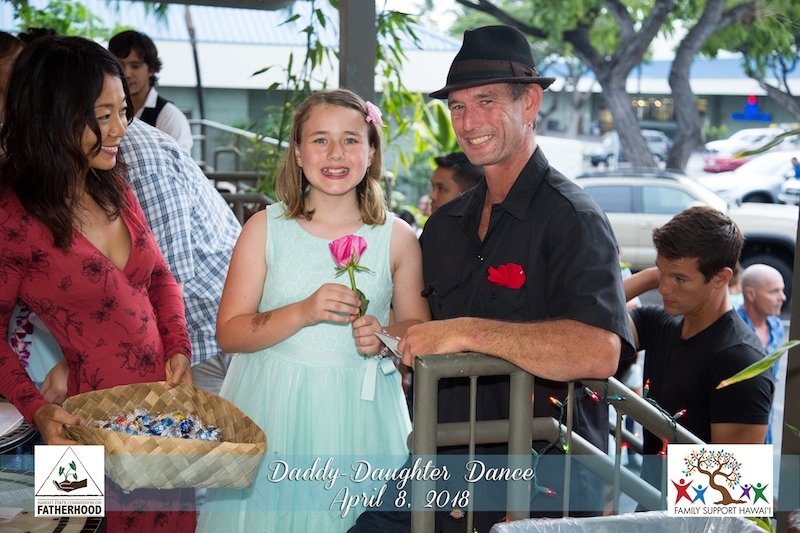 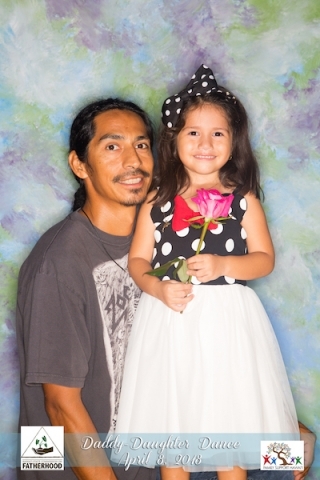 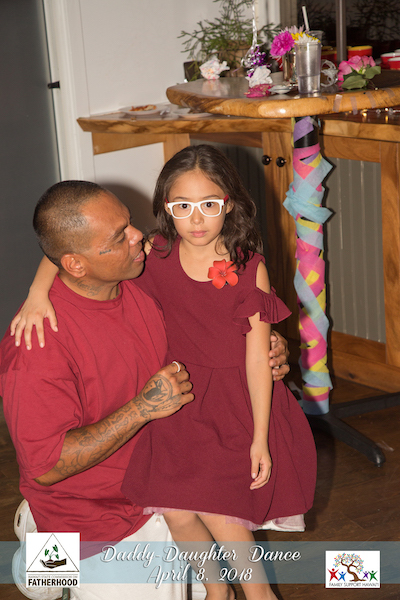 Dads and daughters alike were dressed to impress looking marvelous. Umeke’s Bar and Grill in Kona provided a plethora of ono grinds to give everyone the energy to party through the night. 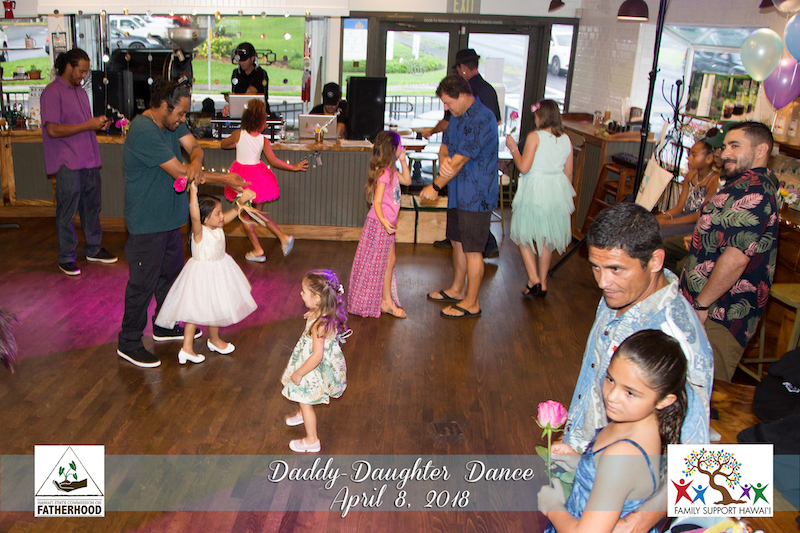 Once the action was under way the program started with challenge number 1; Daddy Daughter Speed Date where fathers were given a list of questions to ask their daughter to learn as much as they could, everything from ‘what makes you smile?’ to ‘What do you think we should do more of together?’. 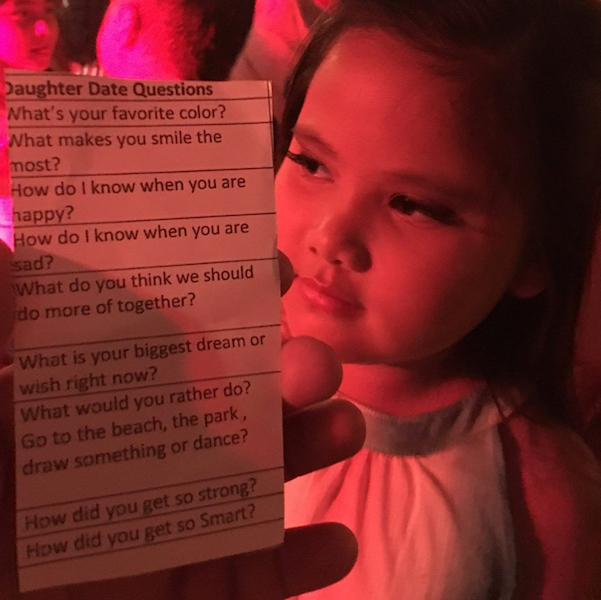 The questions were designed to give dads practice being curious about their daughters and looking to learn more about them and what makes them tick. 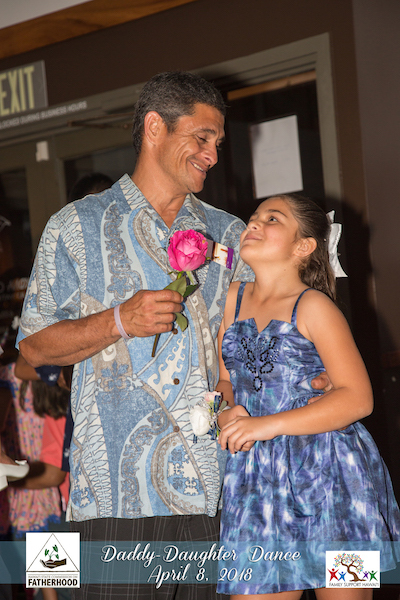 Dad’s volunteered to share some of the things they learned from their daughters and earned a ‘Real Life Superhero’ T shirt! 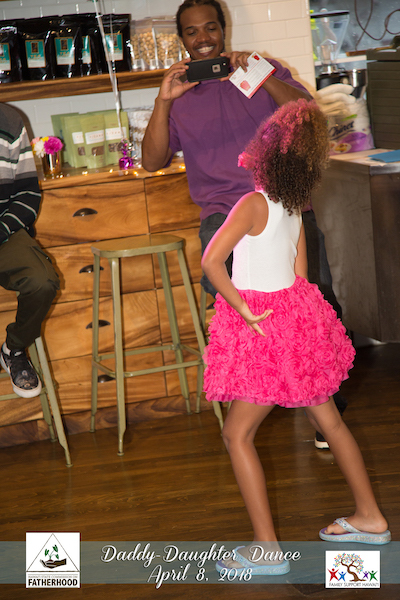 45 minutes later, challenge number 2 got things even more crazy. 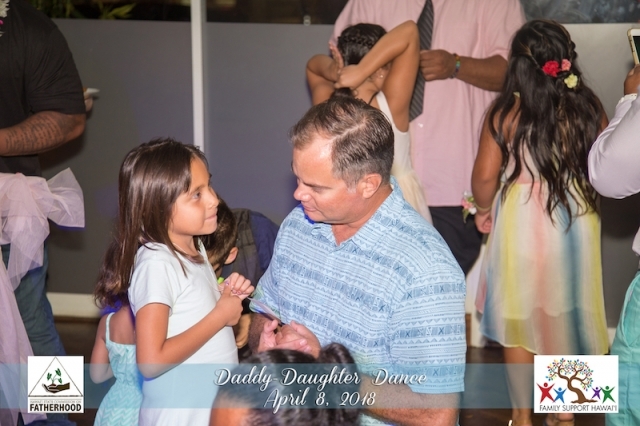 Dads were asked to look their daughters in their eyes and tell them 3 qualities they loved about their daughters then 3 things they do that make them happy. 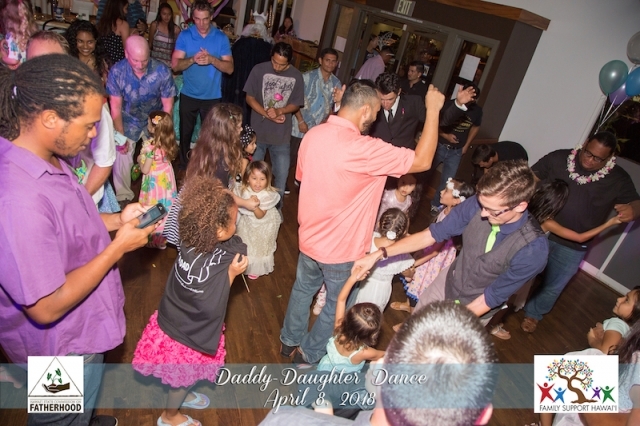 Seeing a room full of fathers expressing such love and admiration towards their daughters was too much for many, we lost a few volunteers and fathers to misty eye syndrome, fortunately they all made a full recovery. The fathers were then asked to make a song out of their responses… it was pure magic. 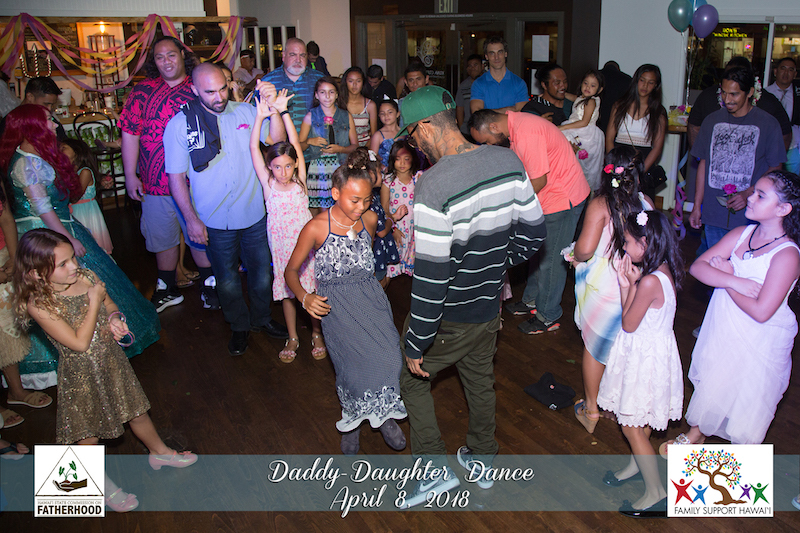 While the fathers took turns singing their songs into the microphone you could absolutely see the girls standards of how they expect to treated by a man increase exponentially! 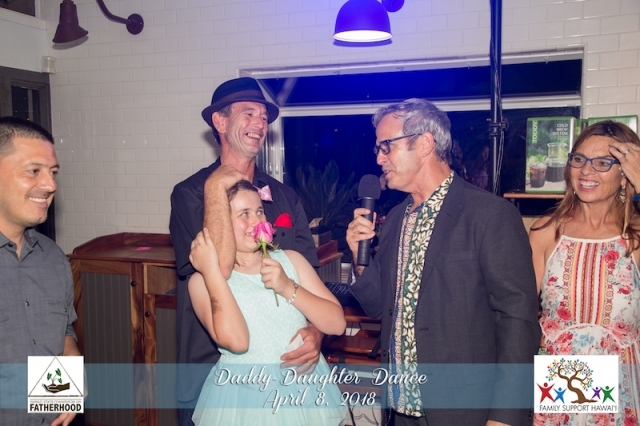 The final challenge of the night was a not so simple, secret handshake. 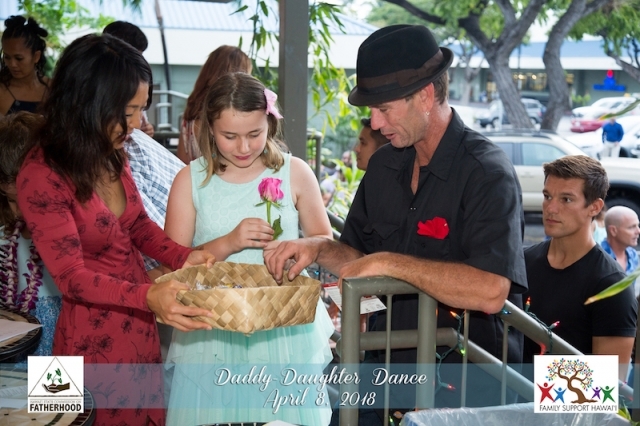 Each handshake included the use of four different body parts, a special sound and a signature move; much easier said than done. Incredibly enough, each pair executed the final challenge and proved to everyone in the room that these daddy’s and daughters were special, to each other and to the rest of us watching in amazement. 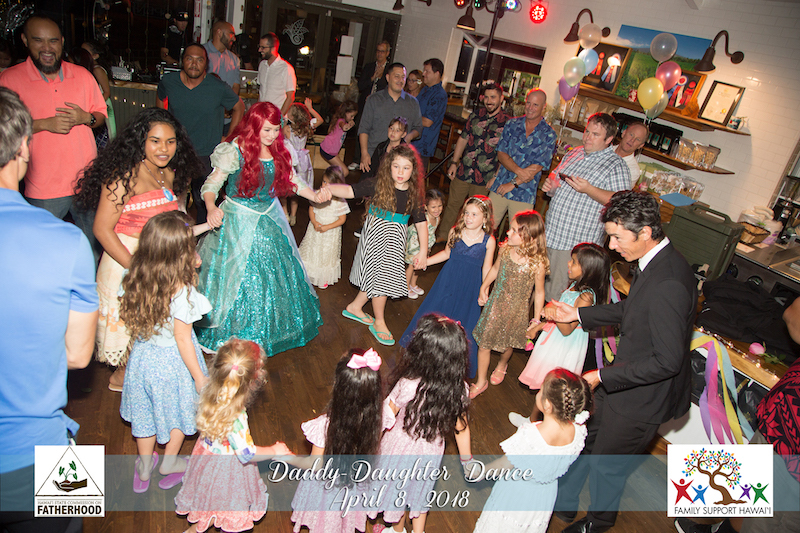 When it was finally time to wind things down, the princesses took over. Ariel took the stage and sang ‘a whole new world’ as all the girls gathered around to sing along. 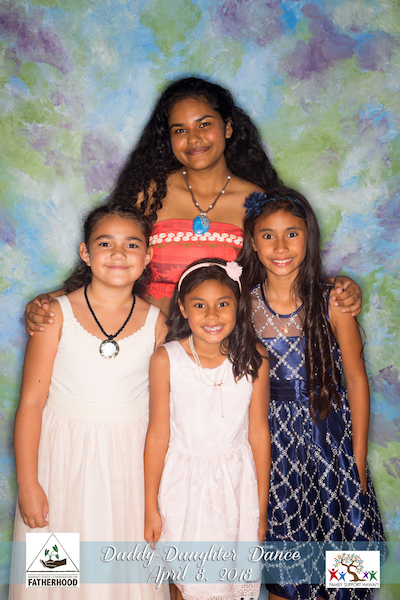 Then it was Moana’s turn… if you have never seen a gaggle of girls singing ‘how far I’ll go’ along with Moana, then you may never truly understand how incredible it was. 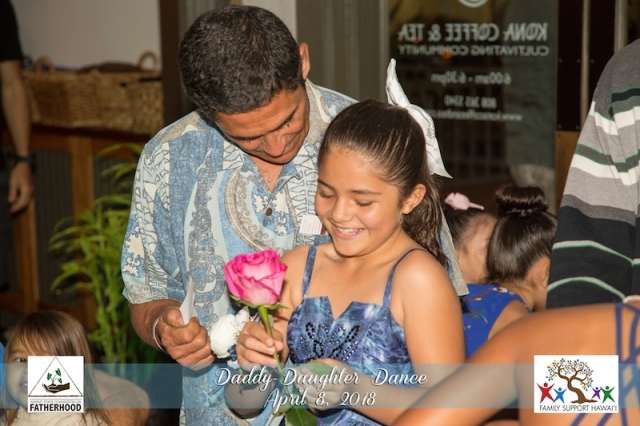 Not a dry eye in sight. 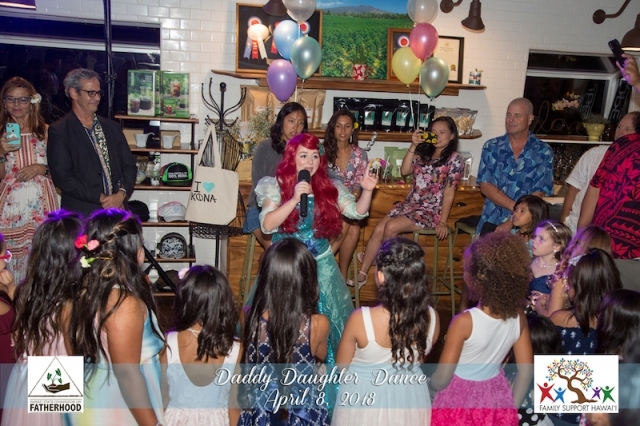 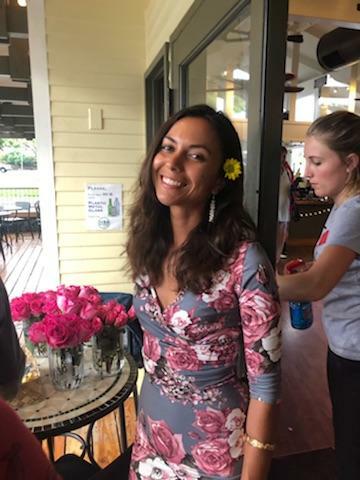 There were giveaways throughout the night including fishing charters, Paddle board sessions, a free princess party, podagee horsehoe sets, movie tickets, Kona Coffee and Tea gift certificates and t shirts. 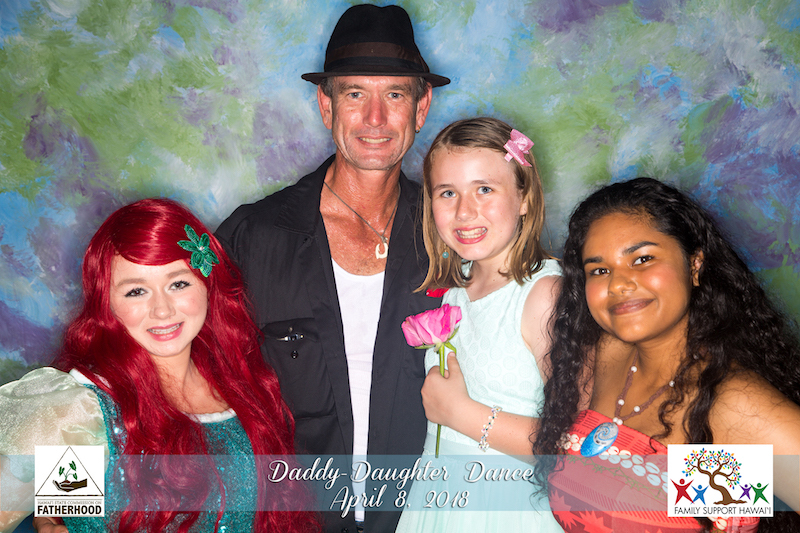 More importantly there were 60 young women who got to spend quality time with their real life heroes.